Sea Launch officials are poring over data from the June 1 launch of the Intelsat 19 communications satellite to determine whether the company's Zenit rocket may have damaged the spacecraft during ascent from an ocean-based platform in the Pacific Ocean. Intelsat 19 did not deploy one of its two solar panels as planned following separation from the Sea Launch Zenit 3SL rocket about one hour after liftoff from the company's Odyssey launch platform positioned at the equator in the central Pacific Ocean. The solar panels are necessary to generate electricity for the satellite, and Intelsat 19's mission to distribute video and television services across the Asia-Pacific region would be curtailed with only one solar panel producing power. In a statement released Friday, Sea Launch said a preliminary data review showed the Zenit 3SL rocket inserted and separated the Intelsat 19 spacecraft into the planned orbit. 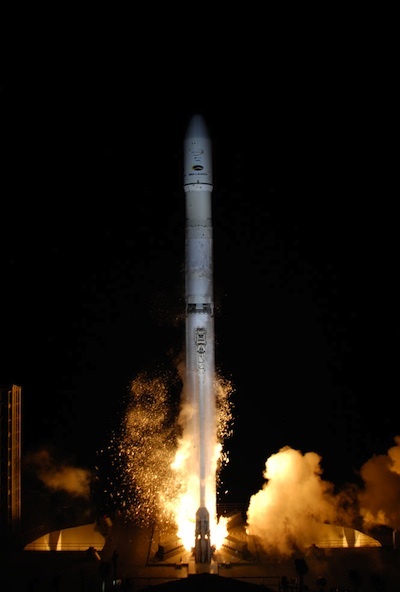 "The preliminary data review indicates that all systems performed nominally throughout the launch profile including fairing and spacecraft separation," said Kirk Pysher, chief operating officer of Energia Logistics Ltd., Sea Launch's technical partner and a subsidiary of Energia Overseas Ltd. of Moscow, the the launch provider's majority owner. Pysher said in a statement there was no indication of re-contact during fairing and spacecraft separation. Boeing Co. builds the Zenit 3SL rocket's payload fairing and accommodations. 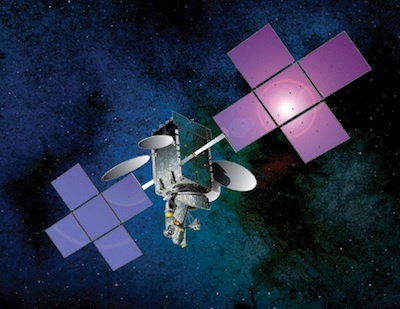 Intelsat 19 was built by Space Systems/Loral of Palo Alto, Calif., and the satellite's solar array trouble resembled a deployment problem with another spacecraft built by Space Systems/Loral and orbited by Sea Launch. The Telstar 14/Estrela do Sul 1 communications satellite failed to unfurl one of its solar array wings shortly after its launch on a Zenit rocket in January 2004. "Boeing engineers did note an unexpected, isolated event around 72 seconds after launch, which registered on microphones and pressure sensors," Pysher said. "We have only seen this one other time out of the 31 flights and while it is premature to speculate on its origin until further analysis is complete, it bears a striking resemblance to a prior Space Systems/Loral mission." Peter Stier, a Sea Launch spokesperson, confirmed the prior Space Systems/Loral mission was the Telstar 14/Estrela do Sul 1 launch. During the 2004 mission, sensors registered a similar signature at about the same point in the flight. Engineers are trying to confirm if the two events are related, and why the incidents occurred with the same type of satellite and launch vehicle. Sea Launch says it conducted seven successful flights of Space Systems/Loral's 1300 satellite bus since the Telstar 14/Estrela do Sul 1 mission. "While our preliminary review indicates that the launch vehicle systems performed well within family and requirements, we will continue our analysis of the available data in a thorough and methodical manner, characteristic of the Sea Launch approach to mission assurance," said Richard Pudil, head of the Sea Launch data review and chief systems engineer at Energia Logistics. Stier said Sea Launch and Energia Logistics would complete the investigation before beginning the launch campaign for the company's next flight, which is scheduled to loft the Intelsat 21 communications satellite in August. Intelsat 21 was manufactured by Boeing Satellite Systems International. Sea Launch currently does not expect the Intelsat 21 launch will be delayed, according to Stier.